South Africa’s finance minister Pravin Gordhan released Wednesday the country’s 2013 budget in which he outlined harsh realities requiring tough measures from his government, but with a positive outlook that will see GDP growth year on year. The minister alluded to the global economic crisis, now in its fifth year, and its effect on slowing down South Africa’s economic growth, which he says now, needs new ideas and pursuing a “different trajectory”. GDP growth reached 2.5 per cent in 2012 and is expected to grow at 2.7 per cent in 2013, rising to 3.8 per cent in 2015. Inflation has remained moderate, with consumer prices rising by 5.7 per cent in 2012 and projected to increase by an average of 5.5 per cent a year over the period ahead. However, Gordhan says the trade deficit is holding South Africa back from making significant gains. Exports grew by just 1.1 per cent in real terms last year, while imports increased by 7.2 per cent. The deficit on the current account of the balance of payments was 6.1 per cent of GDP. To move the economy forward, Gordhan says, the government’s 2013 budget will be based on the National Development Plan (NDP). “The strategic plans of government and the medium-term expenditure plans will be aligned to realise our objectives. Spending plans have been reduced by R10.4 billion ($1.17 billion) through reprioritisation, savings and a draw-down on the contingency reserve,” the minister said. Following the NDP path of spending and the recovery in revenue will stabilise debt at just higher than 40 per cent of GDP. 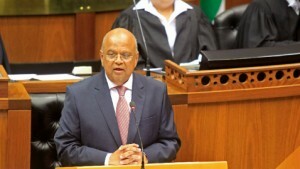 The budget deficit will fall from 5.2 per cent of GDP in 2012/13 to 3.1 per cent in 2015/16, Gordhan added. The budget will also implement a review of South Africa’s tax policy framework and its role in supporting the objectives of inclusive growth, employment, development, and fiscal sustainability, Gordhan said, echoing President Jacob Zuma’s address last week. “In the 2013/14 fiscal year, personal income tax relief of R7 billion ($790 million) is granted,” Gordhan said. The budget report also acknowledged the rise of African markets and the upcoming BRICS Summit in Durban where heads of state from Brazil, Russia, India, China and South Africa will discuss establishing a common bank and improving the infrastructure of the continent. Gordhan says that over the next three years, R827 billion ($93 billion) is planned to be spent by the fiscus and state-owned companies to build infrastructure. The financing for these projects is in place, and is not affected by the spending cuts in the budget, the budget said. The fiscus has allocated just under R430 billion ($48.6 billion) for schools, hospitals, clinics, dams, water and electricity distribution networks, electrification of over a million new homes, sanitation schemes, building more courtrooms and prisons, and improved bus, commuter rail and road links. Most of the spending falls under provinces and municipalities, Gordhan explained.